Balochistan once a very prosperous land with rich history and culture and one of the most important centers of cultural development of Bharatiya subcontinent throughout the history, now has become a graveyard under foreign occupation. Ever since the British invaded and conquered Balochistan on 13 November 1839, the struggle of Balochs to free themselves was underway. After struggle for years, Balochistan got independence from British colonial rule on 11 August 1947. But unfortunately their freedom and happiness did not last longer than a year and on 27 March 1948 the newly created rogue nation Pakistan invaded and captured the land of Balochs. Baloch people are still fighting to get freed from atrocities and hegemony of occupying power. 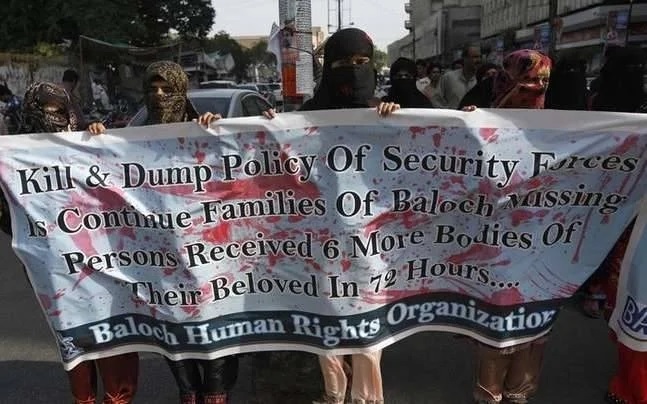 Ever since the invasion of Balochistan, the series of gross human rights violations in the shape of murders, abductions, kidnappings, rapes and destruction of their beloved things started. Pakistan Army has become a brutal mass murderer and the biggest authority in Balochistan. The hegemonic establishment of Punjab province in other parts of Pakistan is known to the whole world. Anyone in the higher order of administrative structure of this captured land is either a Punjabi or a Baloch forced/lured into that position by use of force or money respectively. The whole political/administrative system in the state of Pakistan is indirectly headed by its army and the occupied land of Balochistan is no different. Since the invasion, Pakistan Army has carried out five major military operations in Balochistan to suppress Baloch uprisings against them. Balochistan has witnessed numerous such comparatively minor operations. Once in the course of such periods, Baloch Sarmachars (Freedom Fighters) for a short while managed to free their land. That freedom too did not last long and Pakistan dispatched around 90,000 mercenaries to again capture the Baloch land where they were confronted by 60,000 Baloch Sarmachars fighting to protect their home land. Equipped with advanced and deadly weapons the merciless army of Pakistan killed around 15,000 to 20,000 sarmachars. Forces did not stop at just killing sarmachars and even destroyed their homes and places. To force hidden guerrilla warriors to show up in open, Army abducted their relatives and loved ones. Army still attacks the average villages and settlements because they know to protect their families, guerrillas will come out from their hideouts. Using women and children to fight their war is a well-used tactic of Pakistan Army. Numerous Baloch women and children were abducted and detained into military camps in Bolan and Sibbi. Army demanded that their man husbands/fathers should surrender to forces to save their women and children. Pakistani forces, in order to achieve their targets, never hesitates to attack or harm civilians and never shy away from cowardly using women, elders and children as their shield. Huge number of Balochs were killed in Pakistan military operations in Balochistan in 1973-77 and 2002. Such military actions are worst nightmare for ordinary Baloch people. Every conflict directly affect common hoi-polloi and Pakistani Army’s severe use of force against them only increases their sufferings. Imagine children growing up to such havoc and raised up in an environment constantly filled with fear. Little kids never know when they will get abducted and being used as bargaining material by the forces. Army which tries to portray themselves as the savior and protector of the Baloch people, is in reality the biggest danger to the Baloch people. Balochistan witnessed the event of nuclear bomb testing on their land on May 28 1998, which the average Baloch describes as testing of ‘Islamic Nuclear Bomb’. They completely denounce and refuse to accept or espouse any kind of extremism and even after such generosity they suffer in the hands of occupiers. Pakistan Armed forces has a ‘Kill and Dump’ policy to deal with Baloch people. They abduct, torture, kill and eventually dump them at random places and does not even care to return their mortal remains to their kith and kins. More than 5,000 Balochs have been killed under this ‘Kill and Dump’ policy. There are around 20,000 Baloch political prisoners in custody of Pakistan authorities. Anyone supporting the struggle for their freedom either gets detained, killed or in worst case gets their loved ones abducted and gone missing. Nobody knows the exact number of people detained or killed by Pakistani forces in Balochistan. One can estimate the amount of horror that is being inflicted upon ordinary Baloch people from the fact that over 150 dead bodies of balochs were recovered in three mass graves on a single day of 17th January, 2014. It was perturbing and startling moment for the whole community when they came to know about those 3 mass graves of their fellow people. Disquietude and consternation took over the minds of already suffering people of Balochistan after seeing the plight of their kith and kins in those mass graves. Baloch Leaders of struggle against occupation of their land also suffer severely in the hands of Pakistani establishment. Demolition and loot of houses of Baloch leaders like Hyrbyair Marri is part of average life of those leaders. One such instance was occupation of Nawab Bugti Palace in Dera Bugti by Pakistani forces. Many relatives, including sisters and nieces of Brahumdagh Bugti, were killed in Karachi to send a message to Brahumdagh Bugti. There are many instances of killing and abduction of relatives of Baloch leaders which make their struggle hundred times harder and more difficult. Pakistani forces abducted 2 apolitical sisters of Dr. Allah Nazar Baloch in Awaran and Mashkai regions along with many kids and other 50 women. Pakistani forces have destroyed houses of many leaders and might have been using them as training centers of their local death squad. People who support the movement from outside the country and away from reach of Pakistani establishment are constantly asked to return or else see their relatives suffer. Many leaders never get into Pakistan’s traps but some, for their love of their land and for their people, do dare to enter Pakistan and eventually suffers the same consequences as all other Balochs do. On May 14th, 2016, two Baloch strugglers Dalsar Mand Naeem and Qabool Baloch dared to enter Pakistan but instantly disappeared upon their arrival at the Karachi Airport. Many areas which were settled earlier have now turned into nothing but dilapidated structures. Places which are the identity of the Baloch people are also in danger due to brutal use of force by Pakistan. People of Balochistan do not want to identify themselves with Pakistan and would never accept Pakistan’s supremacy and hegemony over them. Pakistani Army’s dictatorship has silenced thousands of voices through use of force and has shut lakhs more who want to speak. Anyone speaking against Human Rights Violations of Baloch people ends up either in jail or in grave. Murder of Prof. Saba Dashtyari, who raised voice against Pakistani brutality, is a testimony to that. Many Balochs are still speaking for themselves and shouting about their oppression in the hands of occupiers but the need is of the ears to listen. International Organizations like United Nation and Amnesty International, who love to jump into Kashmir for no reason, completely ignores the appeals of average Balochs. The case of average Balochs is extremely unfortunate and heartbreaking. They have been fighting for their freedom since decades and have been suffering for their freedom for years. Unfortunately, the people who have been systematically imprisoned, tortured, abducted, executed and killed for years, have been completely ignored on all international fronts. International organizations need to awake from their ‘Balochs are happy in Pakistan’ dream and must see the mountain of gross human rights violations in Balochistan. Balochs have shown utmost strength by not surrendering in front of their oppressors and have again proven to the whole world that you can imprison the fighters of Balochistan but you cannot imprison the Idea of Balochistan.